My 27th birthday is quickly approaching in September. That's puts me squarely in my late-20s, and one step closer to being 30. I know, I know, that's not very old at all. Which is my point. There are hundreds of leaders in the church between the ages of 18 and 30 still figuring out how to lead well. I was thrust into my first full-time ministry role at the ripe old age of 21, which forced me to learn a ton. I certainly haven't arrived, but I've got enough scars and calluses along the way to share some values young church leaders need to embrace. This next week, I'll unpack 5 of these values. Value #4: Ministry is a marathon, not a sprint. Sprinters develop certain muscles in order to have a quick burst from the line. They are immediately at their full speed, only to come to a complete stop in only a few yards. 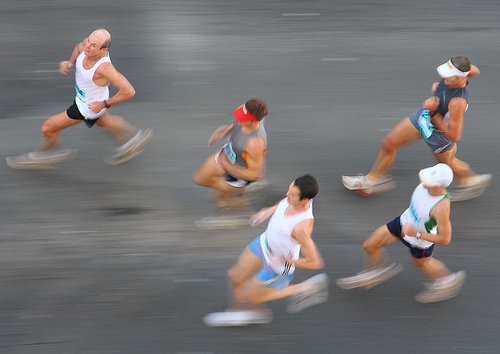 Marathon runners have very different developed muscles and habits. They don't burst off the line. They don't rush everywhere. They are steady, smooth, focused, and very aware of their own bodies. Young leaders tend to be sprinters in ministry--everything could be moving faster, decisions need to be made quickly, and we need to get bigger/better/newer as soon as possible. While that works for awhile, if marathon habits are not built, sprinters will eventually burn out (just like someone who tries to sprint for over 26 miles straight). Maintain a sustainable pace. It's not just about being balanced, but living sustainably. A sustainable pace means that there are moments where bursts of energy and speed are necessary. It also means that moments of rest are normative. It's about recognizing the season of one's life and ministry and responding accordingly. If you're a 19-year-old single guy with a light college load, you should have a different pace than a 38-year-old with four kids putting themselves through seminary. Evaluate your time, your energy, your finances, your relationships, and your connection with God; could you keep this up for the next year? Five years? Twenty years? Celebrate the present, but determine true success in the long-term. It's incredibly important to celebrate current victories. Sharing stories about what God is doing right now is vital to endurance. But the temptation is to allow those small victories to signal success. Remember that there's always next time in both the good and frustrating. Success in ministry and discipleship is measured in the long-term. If the people you're leading are following Jesus now, but aren't in two years, is that really success? Numerous books in the New Testament have the dual encouragements to endure and overcome. Just read Revelation and highlight all the moments John encourages the church to overcome, to stay with the faith, to not lose heart, to not forget their first love. Pacing is easier with others. When I go running by myself, I always find myself giving up after a mile or two. But if I'm running with my wife or a friend who can push me to keep going, I can definitely go farther. It's a healthy kind of peer pressure; you could even call it accountability. I'm individually responsible for my own pace and leadership in ministry, but it's always better when it's done in authentic community. What is your leadership pace? Are you a sprinter or a marathon runner? Or do you need to get off the couch and put on some running shoes? This is part 4 of a week-long series on young leaders in the church. Read Part 1 here, Part 2 here, and Part 3 here.